Happy 2013! I thought I would start off the new year by filling a request. I've posted a small bit of this before, but here is the complete interview from March 1967 between Murray The K, then at WOR-FM in New York City, and Brian Epstein. It lasts just over an hour and while Eppy sounds a bit tired, he's not as drugged up or out of it as Philip Norman's Shout! led us all to believe. In the photo, no; in the interview, yes. There hasn't been a post for a while. Hope all is okay and you will be posting again soon. 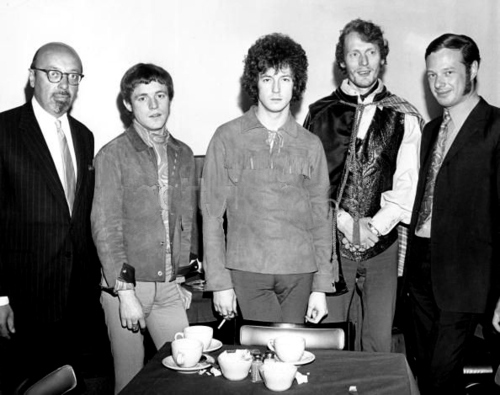 And if that's not enough....a picture of Brian with Ahmet Ertegun....and Cream!!!! Or should I say "The Cream"!!!! Downloading now!!!!! That's it, I'm evaporating into a state of ecstasy!!!! I shall never ask another thing of you ever again!!! Roll Over Mark Lewhisohn and tell Bruce Spizer the news! Going to listen now, thank you sir!!! -mg! Bah!! These writers! (not including John Winn!). Trying to milk the drama no matter what! Give me a break! Eppy sounds, as you say, groggy and subdued and maybe a little slurry in the very beginning ....but hardly some tragic deterioration! Could just as easily be from having to sit through Murray's overly-verbose questions, god bless him! Great to hear Eppy 1.) not on tour or talking to the English press, nice change of pace 2.) in 1967! and 3.) enthusing at length about Jimi Hendrix and The Who (and Cream, the Monkees and The Four Tops!). What a cool guy! What a "with it" guy. This is like those Mal interviews, just great to hang with one of the "inner circle"...for over an hour! Though, let's face it, if Murray could get to the point a little faster, it might have been more like a 20 minute interview! But still, it's great that Murray (like Eppy) was so into the music and what was going on, he always seemed to know which way the wind was blowing. I always love that interview in '64 where he observes that he's never seen so many album tracks become hits. Stuff like that. So, tragedy, smagedy.....Brian sounds like I do after a night out; if Eppy was in New Yawk City, in 1967 no less, I'm sure he had had a good night out, I would think it would be odd if he DIDN'T sound like that! For all we know he's dealing with being blackmailed or something sordid like that and can't wait for Murray to leave the room! At any rate, it's just nice to have one last hour with Brian - like it's nice to have those hours with Mal, or those last interviews with Lennon himself - before they took leave of this mortal coil. Thanks for sharing this historic summit of two men who made the sixties what they were! Wow, this is big! Thanks for sharing! Really enjoyed hearing this fascinating bit of history, and as always, the pithy wisdom in which you present these gems. And I agree: Norman took some considerable creative license in describing this interview. He made poor Eppy sound as if he were on his last legs, bleating out a mea culpa of semi-coherent regret or something. Sheesh: another urban legend laid to rest. He's a little spacy, but exhibits a quite apparent presence of mind, and seems genuinely impressed by Hendrix. Thanks so much John. Happy 2013. LOL! "He made poor Eppy sound as if he were on his last legs, bleating out a mea culpa of semi-coherent regret or something." Ha! Looks like the verdict is, Brian has been vindicated! Hope he had a good time in the Big Apple the night before! Probably a "Midnight Cowboy" scene! Ha, Blue Jay Way just popped up on my i-pod.....now all I can think of is you, John Winn! You Blue-Jay-Way hater!!! Hey, question! I never thought of this, all these years, until recently when I was going through "Eight Arms To Hold You" (the book) and it hit me...... Even though you covered all of John's side-recordings and solo stuff, and Ringo's "Sentimental Journey" and "McCartney" the album, you didn't cover "Wonderwall Music" or "Family Way"! Not that it matters, especially with the Eight Arms To Hold You book, but was there a particular reason? Is listening to "Wonderwall" like listening to "Blue Jay Way" for you?!! (i happen to love "Wonderwall Music"!). Anyone know the date of this? As the blog post says, it's March of '67. You can actually pinpoint it to the last couple of weeks of March, based on various stuff he says during the interview. Ok, first off: I've finally organized my collection and for anyone who missed stuff before all the links were deleted, here's what I've got for you to start with. The 64 American tour stuff! Thanks to the generosity of Our Man Winn, here's the stuff you've been waiting for! (non-music of course) Here 'tis in 5 easy downloads! Enjoy you enjoyers!! I'll post more soon but I figured this was the "missing piece" that people most urgently wanted!! But now, here's the request, for what I most urgently want! If any of you can help me out, if not, no biggie, 'dems da breaks!! My request is this: I seem to have lost the entire Australasian tour (including Copenhagen and Blokker, et al). Basically, I think I deleted it all by accident. Now, I have all the Australia interview records that came out, and I have the Purple Chick and the Lazy Tortoise, Silent Sea stuff....but any of the unbooted stuff from that tour that John posted here - and there was plenty - I am totally missing. So....if anyone of you kind Beatlefreaks could fill in MY missing piece, that would be awesome. Not holding my breath, don't worry, and either way, Winn willing, I'll continue to repost the special nuggets of Beatledom that Mediafire wiped out. (and John, feel free to just make a new blog post with these links if you like, or not, whatever you feel). Beatles Forever! And ever and ever and ever......! And don't thank me, thank John!!!! He's the one who shared these amazing, historic, rare recordings! Thank you John! There hasn't been a posting for some time - we miss your postings. We hope that all is well and that you're ok. Looking forward to next postings. I'm sure "being afraid" isn't why he's not "throwing us a bone". He said he was going to take a break from the blog, maybe permanently. It's not like the guy hasn't given enough. I will use this blog for something in the future, no doubt. But I have been busy with other things lately, and needed a break after three and a half years of near-constant updating. So far, I have shared every Beatles-related interview from 1962 through 1975, and dozens of vinyl Beatlegs. Thanks a million for three and a half years of unique Beatles memories, John. Like others, I'll be checking your blog regularly as well. No doubt you'll surprise us once again. This may sound ignorant but Is there anyway to get the lost recordings Reloaded ?? I love your site and had an accident with many of my downloads. what DVD ## is it on and where? is it a book mistake or is it somewhere else? It's near the beginning of part 4, underneath discussion of the US tour about 15 minutes in. Hey Beatlepeople!!! I think I just found something we all don't have! Maybe not even Mr. Winn himself!!!! It's the full Milwaukee press conference in '64, 22 minutes, plus a short interview with George! It also includes part of "A Hard Day's Night" from the concert (drowned out by screaming). The entire 27 minute file is obviously from a radio report done at the time. It's actually one of the better, more orderly press conferences! John's not there (resting his throat! ), so Paul and Ringo are in relaxed, quip-mode. Two tidbits are revealed! When asked about World Without Love, Paul mentions they've had it for years but always laughed it off. Ringo interjects (or I should say, protests! ", "I always liked it! ", Paul concurs, "Ringo always liked it but we always laughed it off". Then GEORGE concurs "We always laughed it off! ", and Paul continues, saying that Peter and Gordon asked to do it. This jibes with a comment Lennon says in either the Detroit or Chicago press conference. Also, in the short George interview, he's asked how they chose Jimmy Nicol. George says they had only two choices, and that they chose Jimmy because his hair was longer! Here 'tis. (it starts with the Larry Kane interview that we already have). Great find! This was new to me (apart from the Kane section). Another tidbit revealed (and which proves a theory I've always had): George says they made "I'll Cry Instead" exactly the length to fit the chase scene in AHDN. This would explain why they recorded it in two sections, and why the US and UK mono mixes are different lengths! You know how I found this, John? I was looking for the fan interview you mention in "Way Beyond Compare" ("I'm not going to spazz out about it")! So I just went to You Tube, wrote Beatles in Milwaukee, and...voila! This came up! I couldn't believe it! So...it's really all because of you, in a roundabout way!!! Great about "I'll Cry Instead"! I missed that part, I must have been coughing or something! That's a huge tidbit! When John says that Richard Lester didn't like that song (in that amazing Howard Smith interview you posted, when WPLJ was doing the Beatles marathon...if only Smith let John reminisce more! ), I almost thought that John might be mistaken, since it was recorded after that first batch! But now it makes sense! The scene was shot, and so the song was made to order! George corroborates John! All the pieces of the jigsaw puzzle coming together, yet again! Unbelievable. Amazing so many tidbits revealed in one press conference! Especially since the ones before and after it weren't such "joyous" affairs! I wonder if they're a little more relaxed because sharp-tongued Lennon isn't around! Super psyched you didn't have this already, brother! Especially since I listen to stuff you hipped me to, and read your work,literally every single day! Just listened to the Toronto and Montreal material last night, in fact! John, i didn't know how else to tell you.....and I don't know if this is an old abandoned project of yours, or if it is something you are currently working on.....but wow, I just happened upon the 1963 "calendar", on the Multiplus site, with all the pictures and stuff put in order, holy moly.....wow...that's all I can say....tons of pics i'd never seen before, and (as usual) you are putting the pieces of the jigsaw puzzle back together, it's just amazing. Totally blown away. Again. And, again, thank you for sharing all this/that work with us, it's just unbelievable. Just a slight question: is that an ongoing concern, or is it a project that perhaps fell by the wayside and you won't be working on anymore (just so I don't keep returning to it every day!) (i'm correct in saying that it's only 1963, right? I couldn't get onto any other year). Bravo, Beatleman. (with an exclamation point!). It's the greatest thing ever, since this blog!!!! Thanks! It's a long-term project that I work on when I have the time. I am constantly collecting photos and other material for it, which I tuck away in folders on an external hard drive. I only have January through May 1963 posted so far. I do the writing and layout a day at a time, and upload a full month when it's ready, so June '63 will be next. You can bookmark the calendar page (http://www.multiplusbooks.com/1963.html) and check occasionally for updates. No need to return to it every day at this point! When I have all of 1963 completed, I will "open it to the public" by spreading the word so that anyone can add contributions.